Anoptic was a collaborative project with Derek Barnett and was conceived as a minimal comedic tragedy. 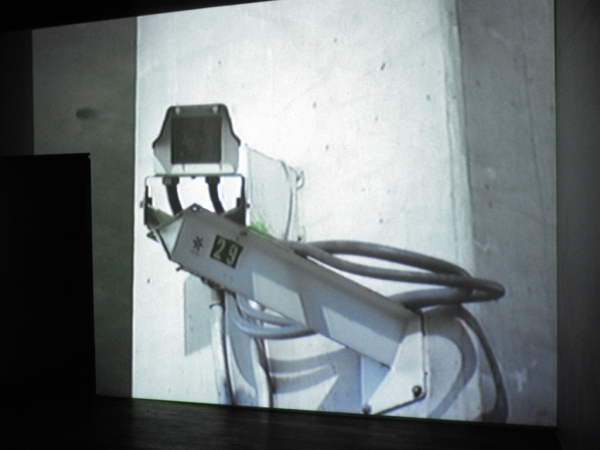 The work is a confrontation between a 35mm film motion-picture camera, and a government-owned surveillance camera. Each of the cameras’ hegemonic associations (spectacle and panoptic scrutiny, respectively) are dispelled in the conflict. The mediation of the otherwise threatening presence of the surveillance camera nullifies its power to evoke self-censorship. Likewise, the banality of the static film of the surveillance camera, recorded by the 35mm film camera dissolves any potential for spectacle.